The following is a November 2017 update of the obituary the family of William A. Peeples II wrote in November 2003. William Augustus (“Bill”) Peeples II, U.S. Navy veteran of World War II, veteran newspaper editor and writer for the Miami News and the Los Angeles Times, died Friday, Nov. 21, 2003, in Santa Monica, Calif., from complications of pneumonia. He was 82. 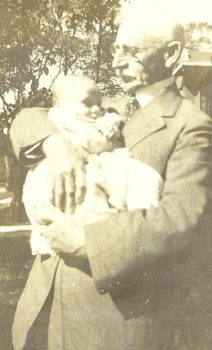 William A. Peeples and William A. Peeples II, Chicago, summer 1921. In his illustrious life and career, Peeples earned one B.A. and two Masters Degrees, one each in History and Anthropology, traveled the world with the Navy and then as a travel editor, and raised two children who also became journalists. Though he never taught professionally, he was a great teacher, and many people learned much from him. He found much joy and satisfaction in sharing what he learned through studying and living. Named after his paternal grandfather, Peeples was born at West Suburban Hospital in Oak Park, Illinois, on June 16, 1921, to Cornelius J. (“Neal”) Peeples, an executive of Chicago’s Pioneer Savings & Trust bank, and his wife, Mary-Florine Thielens (“M.F.”) Peeples, a community activist, club woman and member of the Daughters of the American Revolution. William (“Billy”) was the fourth of five children born to Neal and M.F. 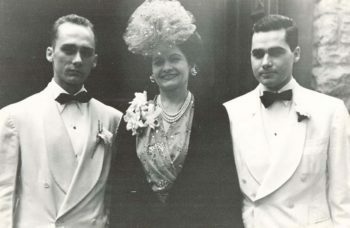 in the decade during and after World War I, following Edward (“Ed”), Persis-Jane (“P.J.”), and Cornelius (“Corny”), and preceding the youngest, Richard (“Rich”). 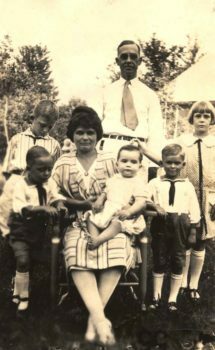 The Midway Peeples family on William’s fourth birthday, June 16, 1925: Edward, William, Mary-Florine with Richard, Cornelius, Cornelius Jr. and Persis Jane. As Bill recalled in an autobiography he penned in February 1949 at age 27 as a course assignment in his senior year at the University of Illinois in Urbana-Champaign, he and his siblings grew up as part of an extended but unusually close-knit, fun-loving family. “My mother’s two sisters also lived in Chicago, as did my maternal grandmother,” he wrote. 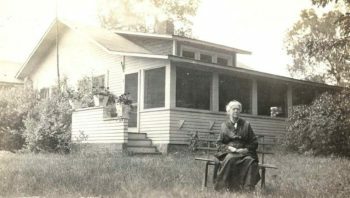 “Granny [Thielens] bought, in 1920, a cottage in Michigan that served as summer headquarters for all three families. [At Lakeside, which the family named it], the 10 cousins learned how to swim, take naps after lunch, play tennis, got sunburned before they learned how to get an even tan, and had a wonderful time smoothing each others’ rough edges. The best part of it was the growth of friendship that has lasted and been refined through the years. “For all of my childhood and adolescence,” Bill continued, “we lived in a large house [at 5740 Midway Park] on Chicago’s west side, on the prettiest street in the neighborhood. It had a parkway down the middle and huge oak trees arched from either side of the street to form a green canopy in the warmer months. “Mom was…an inveterate club woman who seemed to spend more time away from home than in it. Dad was an uncommonly good man – one who didn’t have to go to church on Sundays to show that he was a good Christian. He lived like one. 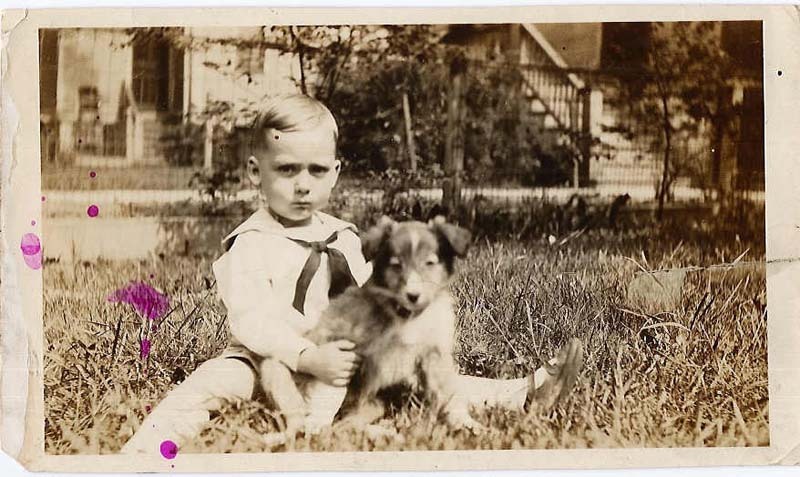 William A. Peeples on his fourth birthday, June 16, 1925. “When I was three years old, he became president of Pioneer Trust & Savings bank, an institution to which he’d gone 10 years before as vice president in charge of reorganization. He was shrewd and capable in business, as well as considerate; in his relations with his family, he was a kind and thoughtful teacher. Young Billy did well in primary school and was a voracious reader from an early age. In his preteens and early adolescence, he was also a member of the Jack & Jill Players, an ensemble of local children (including Corny and Rich) who acted in various roles on Chicago radio stations, such as WBBM. Mary-Florine was an active supporter of the Jack & Jill troupe and created many of the children’s costumes for the benefit of the studio audiences. Granny Thielens at Lakeside, 1930. Bill wrote: “My next oldest brother [Corny] and I were entered in a dramatic school when I was nine. The school presented plays for which admission was charged, and the kids learning the art also had to pay for the privilege. Through the school, my brother soon made a start as a radio actor on kid programs, and I followed him into radio. The former Peeples abode at 5740 Midway Park on Chicago’s west side as it looks today. In 1931, Neal Peeples died suddenly after kidney surgery, a tragic event that deeply affected his surviving family, both immediate and extended. Eldest son Ed and daughter P.J. were especially helpful to their younger siblings as they all dealt with the shock of losing their father. 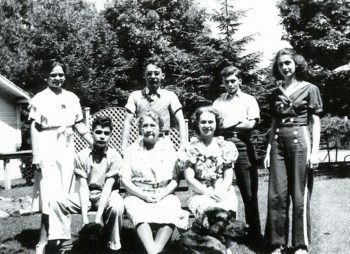 Fortunately, Neal’s investments helped cushion the harshness of the Great Depression for the widowed Mary-Florine and her five young children. After a few years playing various radio roles in “Skippy” and other shows including “Jack Armstrong” and “Little Orphan Annie,” Bill wrote, “My voice changed too quickly, and so I concentrated on high school…I had some good times in radio acting, but disliked the falsity, as it seemed to me, that was necessary to please the directors and the sponsors. “I remember my high school years as a time when I was eager to be finished with school and off to investigate what went on in the world. The high spots of those years were when my two best friends and I would take trips to other states in the Midwest, during the summer. MF, Rich, Granny Thielens, Bill, cousin Rosalie Thielens, Corny and PJ, Chicago, 1937. “Sometimes we’d hitchhike and sometimes we were lucky enough to get an old jalopy to use,” Bill wrote. “It was a rare time when we could get a car from our parents, but those trips were always better because they were more comfortable. We’d never bother with summer hotels or tourist courts but slept in the car at night, unless we drove all night, by turns, in which case we’d sleep on some beach until noon. Bill Peeples at Great Lakes Naval Base, September 1939. 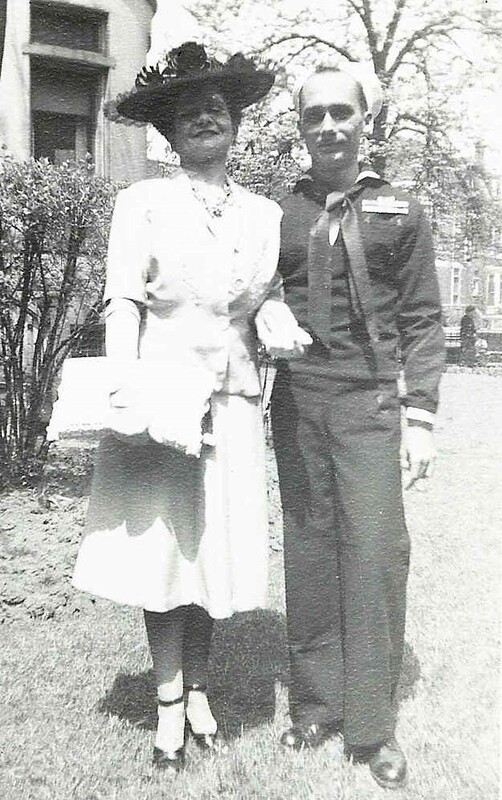 While in L.A., as tensions were escalating a world away in Europe, 18-year-old Bill decided to return to Illinois and join the Navy. He and his buddy ran out of bus money by the time they hit San Bernardino, so they rode on top of freight trains the rest of the way back to Chicago. During his high school years Bill also became a huge fan of swing, especially music by big bands led by Benny Goodman, Glenn Miller and the Dorsey Brothers, and began collecting 78s, eventually building a library of a couple hundred sides. Mary-Florine Peeples and sailor son Bill in Chicago, 1944, when he was home on leave. Ed had enlisted in the Army Reserves and Persis-Jane joined the Navy as a WAVE Ensign. But Bill was the first of the five Peeples children to enter into active duty. He was also the only Peeples male in at least two generations to opt for the Navy instead of the Army. 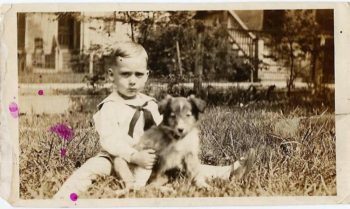 When he joined the Navy on October 11, 1939, it was only five and a half weeks after Hitler’s invasion of Poland, which sparked World War II. Corny and Rich enlisted in the Army as well. 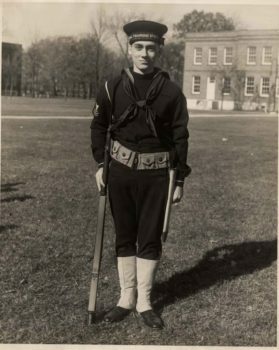 After training at Great Lakes Naval Base, Bill served for the duration of the war as a Quartermaster on vessels ranging from sub-chasers to battleships, sailing between Hawaii, Okinawa, Panama, the Caribbean and Iceland. He had also traveled in 46 of the 48 states by V-J Day, Aug. 18, 1945. When Hiroshima and Nagasaki were A-bombed in the previous few days, Bill was actually with a massive U.S. fleet that had been preparing to invade Japan. The fleet arrived just after the war ended and wound up assisting with security in the defeated nation. Several months later, Bill was finally was sent home to Great Lakes and received his Honorable Discharge on May 26, 1946. 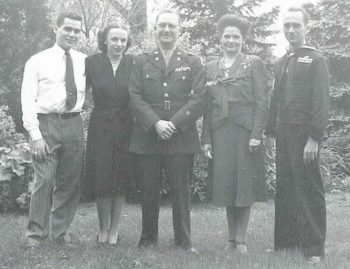 Chicago, May or June 1945: Rich (just home from POW experience), PJ, Ed, Mary-Florine and Bill (on leave before shipping out to the Pacific). Corny, in the Army, made it home OK but not in time for this pic. With the notable exception of Rich – who was forced to endure capture and torture by the Nazis and five months in three German prison camps in early 1945 before being freed by the Russian army and sent home to train to go to Japan to fight again – all the Peeples siblings who served their country so willingly and selflessly during World War II returned home safely. “I consider it time well spent,” Bill wrote in 1948 of his more than six and a half years of active duty. “I learned navigation, celestial and dead reckoning; learned how to steer all sizes and types of ships in all kinds of weather; and learned how to get along with all kinds of people. 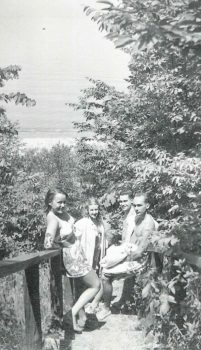 Lakeside, 1946, from right: Bill and Rich with then-girlfriends Faye and Patti, on the long wooden stairway from the house to the shore. “My job as a Quartermaster was, for a large part, as assistant to the officers of the deck, underway and in port, and had to do with recording events as well as acting as a ‘getter-doner’ of myriad routine and incidental tasks. It was good training in improvising and accuracy and personal relationships. In September 1946, after spending his first summer as a civilian in six years working as an announcer for a small radio station in Durham, North Carolina, Bill arrived at the University of Illinois campus in Champaign-Urbana. His declared major, not surprisingly, was journalism. He pledged the Delta Tau Delta national social fraternity, as his father Neal, uncle Ted and brother Ed all had done before him, and took up residence at the chapter house. Bill, Mary-Florine and Rich, 1946. Bill also entered the U of I’s Division of Special Services for War Veterans program, which allowed him to establish his own curriculum and pace of study. By the end of his first semester as a freshman, he’d passed enough GED tests to become a second-semester sophomore. Bill accelerated his academic program so he could complete studies for his journalism B.A. in three years instead of four. He began his second semester at UI in early 1947 by being initiated into Delta Tau Delta and joining the staff of The Daily Illini, the venerable campus newspaper. “I’d had no previous newspaper experience whatsoever, but had decided the Illini was the place to get started with my learning the business,” Bill wrote. He also joined the undergraduate chapter of Sigma Delta Chi, the professional journalistic society, a membership he maintained the rest of his career and well into retirement. He worked as a novice reporter his first term on the paper but was appointed a copy editor for the summer session that followed. Bill was reappointed a copy editor at the beginning of the fall 1947 semester, then left the City staff to begin working the rewrite slot. By that November, he’d been appointed City Editor. Bill was promoted to Associate Editor for the spring, summer and fall ’48 semesters, and finally landed the top job, Editor, for his last term beginning in early 1949. Joan Ruth Sullivan, age 17, and Pepper, her beloved cocker spaniel, Neenah, Wisconsin, 1946. Bill had met Joan Ruth Sullivan in November ’48 while at UI and the Illini. 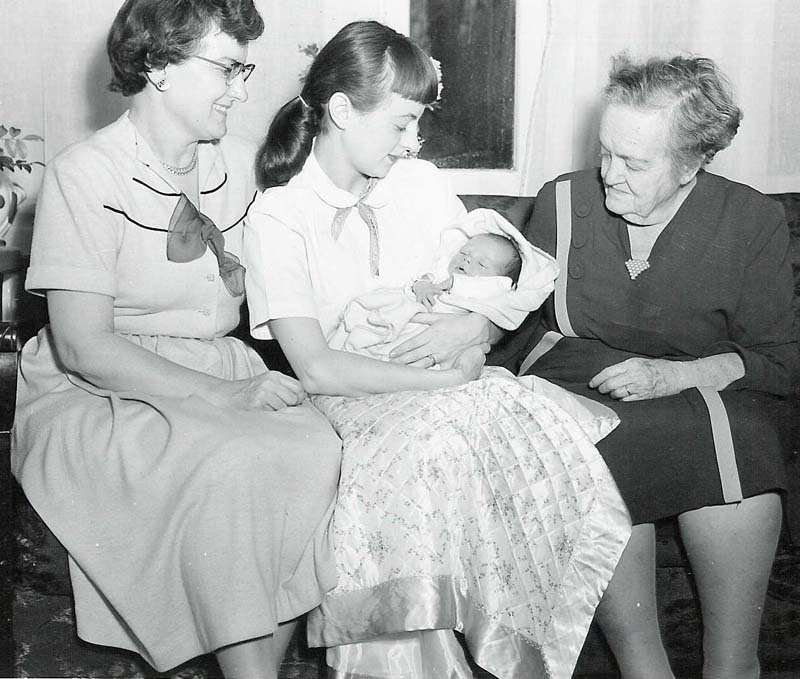 Her father, Jack Sullivan, had deserted the family when she was an infant, so her mother, Zelda Ruth Sullivan, and grandmother, Zelda Ruth Locke, raised Joan in the small mid-Wisconsin paper-mill town of Neenah, home of Kimberly-Clarke. Bright and high-spirited as she was beautiful, the chestnut-haired Joan was an Illini reporter, as well as a talented copy editor, writer, sketch artist, piano player and all-around mischief-maker. Among other things, Bill and Joan shared a love of English and journalism and the pressure and sense of accomplishment of working against and making deadlines, and with something thoughtfully done instead of carelessly thrown together. Engaged when he pinned her during a visit to her mother’s home in Neenah that New Year’s Eve, Bill and Joan were married the following June 12, 1948. “We plan to have six kids, beginning the year after I graduate,” he wrote a few months before the wedding. After earning his journalism degree in August 1949, and during the next decade, Bill was employed in myriad jobs ranging from door-to-door milk deliveryman to public relations director for the University of Chicago Medical Center. 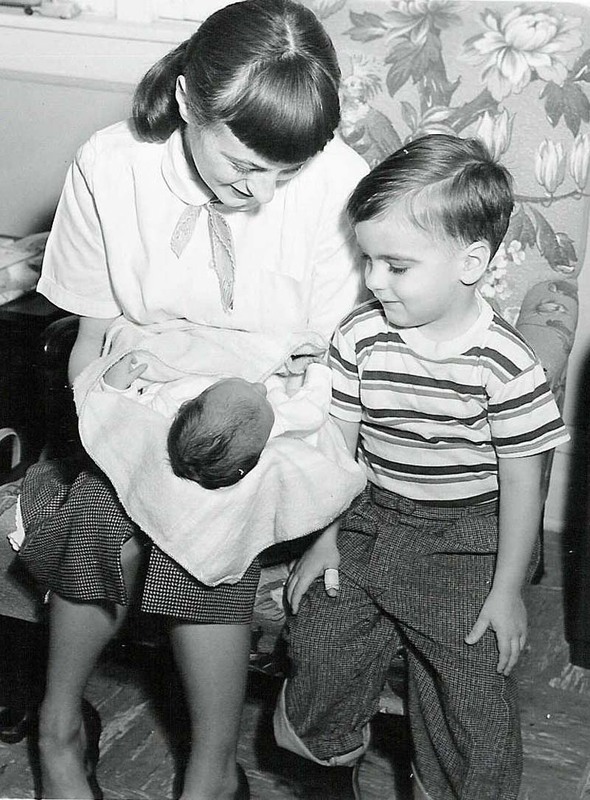 Proud mom Joan with Ruth and Stephen, Park Forest, Illinois, February 1955. Bill and Joan decided to hold off a bit on starting a family, and it wasn’t until Oct. 3, 1951, that she gave birth to their first child, Stephen Kerr Peeples. He was born in Kansas City, Mo., while Joan and Bill were en route back to Illinois from a visit to Colorado. She went into labor outside of K.C. and the couple found a good hospital there. After a several-month layover residing in nearby Jefferson City, Mo., the new family returned to the Chicago area and settled in suburban Park Forest, Ill.
On Jan. 17, 1955, Joan gave birth to their second child, Ruth Locke Peeples, in Oak Park, Ill. Over the next couple of years, the family endured a period of economic hardship and domestic turmoil, culminating in Bill and Joan’s separation and divorce in 1957. 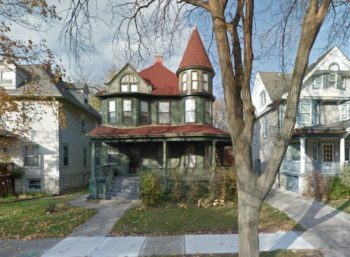 Joan and the children moved to a house in Neenah, Wisc., next door to a dairy processing plant on Commercial Street, a block away from a home on Maple Street shared for many years by Joan, her mother, Zelda Ruth Sullivan, and Joan’s grandmother, Zelda Kerr Locke, after Joan’s father took off. Bill, meanwhile, followed a lead from an old Navy buddy and moved to Miami, Fla., where he landed a job as a copy editor for the Miami News, the city’s afternoon daily, and dogged competitor of the larger Miami Herald, Miami’s morning paper. Eventually, Bill and Joan realized they couldn’t live without each other, and that Ruth and Steve needed a full-time father. They forgave each other’s transgressions and Bill moved back to Wisconsin temporarily. 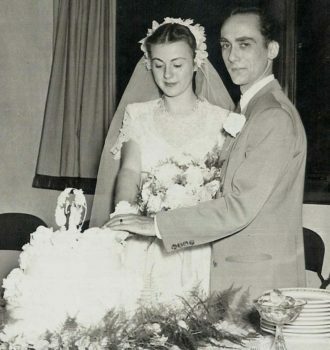 He and Joan remarried in Neenah on Aug. 29, 1958. As one last brutal Midwestern winter thawed into spring, Bill mercifully moved the family to Miami in late May 1959. He drove a drive-away car south and served as advance man; a couple weeks later Joan and the kids followed, flying in a North Central Airlines DC-3 from Oshkosh to Milwaukee, where they boarded a Northwest DC-7C turboprop bound for Miami. In early September ‘59, after a few months living at the Silver Springs Motel across from Miami International Airport and getting oriented to the area, the family settled in a duplex at 1127 N.E. 123rd street in quiet suburban North Miami. Bill’s old copy-editing post at the Miami News had been filled during his extended absence, so until another editorial slot opened up, he took jobs selling new cars, first at Austin Ford on NW 7th Avenue, where he performed well enough to accept an offer for a better-paying position at larger rival J.D. Ball Ford, also a bit closer to home. He’d drive a new Ford demonstrator home every day. 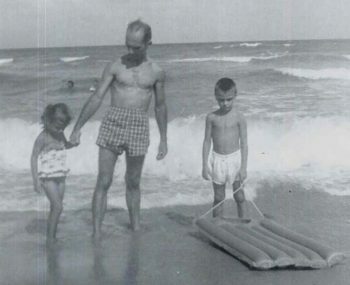 Bill with Ruth and Steve on the kids’ first time at the ocean, Miami Beach, early June 1959. Photo: Joan Peeples. Meanwhile, Bill introduced his wife and kids to the joys of a subtropical lifestyle, especially swimming, body-surfing and sunning at beaches and from Ft. Lauderdale south to Key West. He vowed to never shovel snow again. He never did. Once re-hired at the Miami News in 1961, Peeples served as copy editor and editor of the daily city, national and international news stories that came in via the AP, UPI and Reuters wire services and from the paper’s own beat reporters and columnists. In rotation with his fellow editors on “the rim,” Bill would take the editor’s chair in “the slot” and dole out the barrage of incoming stories to the “rim” editor most familiar with the given subject. Then he’d check the editors’ work, make final edits, stuff the copy into a big plastic capsule, and shoot it via pneumatic vacuum tube to the composing room on the level below. It was fast and furious, it was real life, and it was his element. In November 1961, Bill and Joan bought their first house, at 950 N.E. 140th Street in North Miami, just a couple miles north of the duplex. It was a modest three-bedroom, two-bath house in a neighborhood built after World War II. 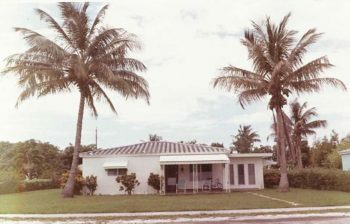 Two coconut palm trees in the front yard framed the house, and the backyard foliage included fruit-bearing avocado, mango, orange, grapefruit and banana trees. 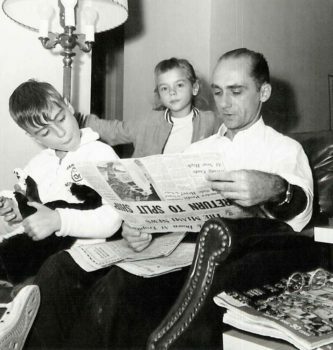 Between their own editing and proofreading duties, Bill and Joan helped both kids with their homework and taught them the basics of writing, editing, and the behind-the-scenes workings of a newspaper, experience the youngsters found invaluable in their own careers years later. By 1966, however, William A. Peeples the career journalist was ready for still greater challenges. Always fascinated with history and non-fiction, especially relating to the ancient civilizations of Europe and the Mediterranean, he decided to return to college, his goal to earn a Ph.D. in physical anthropology with an eye to teaching at the university level. Joan Ruth Sullivan Peeples, wearing a favorite cat skirt, Miami News, March 1964. Photo: Stephen K. Peeples. He enrolled at the University of Miami that September. In summer 1967, the UM Anthropology Department faculty chief invited Bill to join an underwater archaeological expedition to Greece, and serve as the expedition’s underwater cameraman. Bill and his son Stephen, then 16 years old and an avid swimmer and surfer, took a SCUBA course in Miami to earn NAUI certification before Bill took off to Greece. His expedition brought back numerous artifacts and lots of Bill’s footage documenting the underwater dig. And, that August, for the first time since his years in the Navy, he came back from sea sporting a beard. After earning an M.A. in History in June 1968, Peeples moved his family to the Los Angeles area, where he continued his anthropological studies at UCLA. 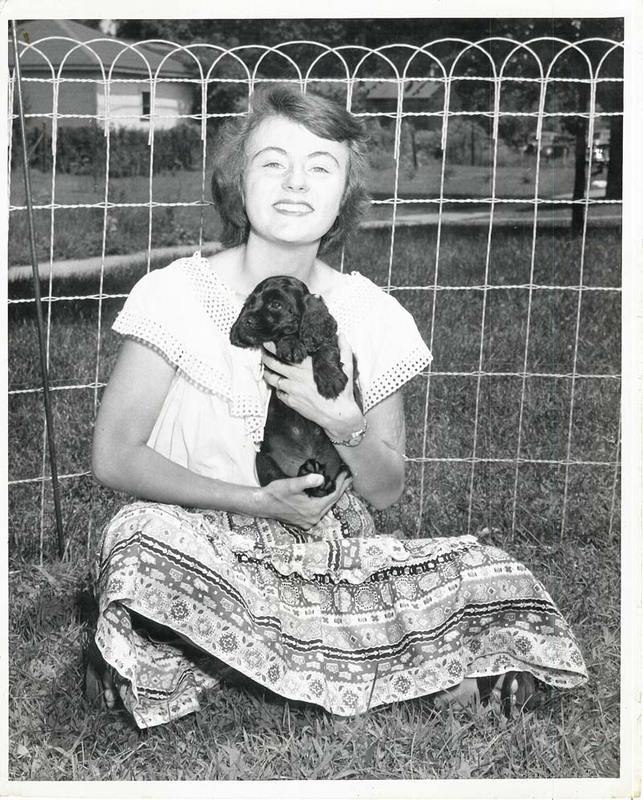 With her children in their teens, Joan went back to work in 1969 to help fund her husband’s educational/teaching goal, continuing to pursue her art while augmenting the family income by painting commissioned portraits of pets for clients all around Southern California. She was an early and avid supporter of Cat Fancy Magazine and expressed her love for animals through her portraits of pets and wildlife. 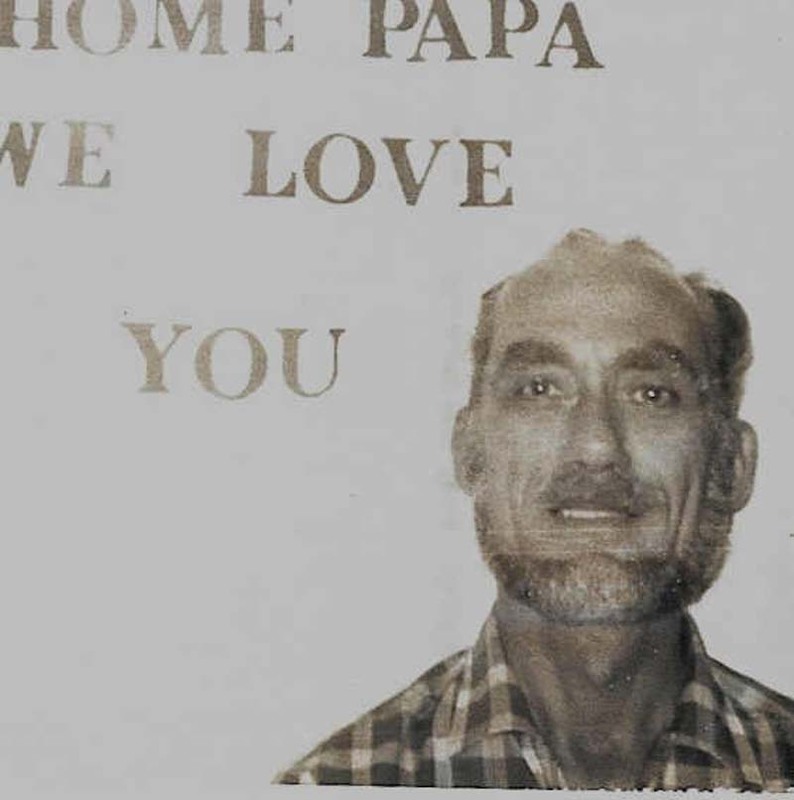 Bill Peeples, home from Greece, August 1967. Bill earned his second M.A., this one in Physical Anthropology, at UCLA in 1970, and was accepted into the UCLA Anthropology Department’s Ph.D. program. To earn extra cash, he took a series of part-time jobs that allowed him lots of reading and study time, ranging from security guard at the Loyola-Marymount campus in Westchester to theater projectionist at an X-rated movie theater in Culver City. He was a year into his doctoral program when Joan was diagnosed with breast cancer in 1972. After a period of treatment, she was able to return to her post as an Executive Secretary at Dart Industries in Los Angeles. Two years later, however, cancer invaded her lymph nodes, then her lungs. Without complaint, Bill suspended his studies to care for his wife during her final agonizing months. 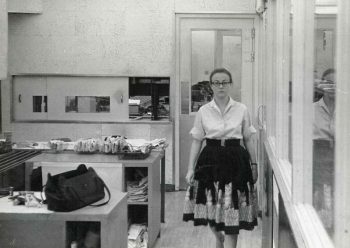 Devastated by her early death at age 44 on June 21, 1974, he tried but was unable to complete his Ph.D., and instead decided to return to work in the field of journalism. In January 1975, Peeples joined the Los Angeles Times as an editor of the daily View section, later moving to a post as a writer and editor for the paper’s popular Travel section, then edited by Jerry Hulse. Bill Peeples and Marguerite Vauclair marry, March 25, 1982. Peeples was once again in his element. He got to travel extensively on assignment and made many valuable contributions to the section until he retired from full-time work in spring 1986. He continued as a part-time writer/editor/contributor through March 1991. 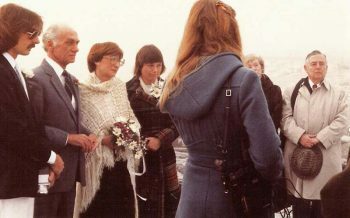 While working in Travel, Peeples met freelance travel writer Marguerite Renée Vauclair, of Newport Beach, R.I. After a lengthy courtship, they married on March 25, 1982, in Newport, R.I., on the beach close to the sea they both loved. They settled in Brentwood, California. The marriage was relatively short-lived, however; the couple separated on Jan. 15, 1986; Ms. Vauclair stayed in Brentwood and Peeples moved to nearby West Los Angeles. They divorced in December 1986. Ms. Vauclair eventually returned to the East Coast. 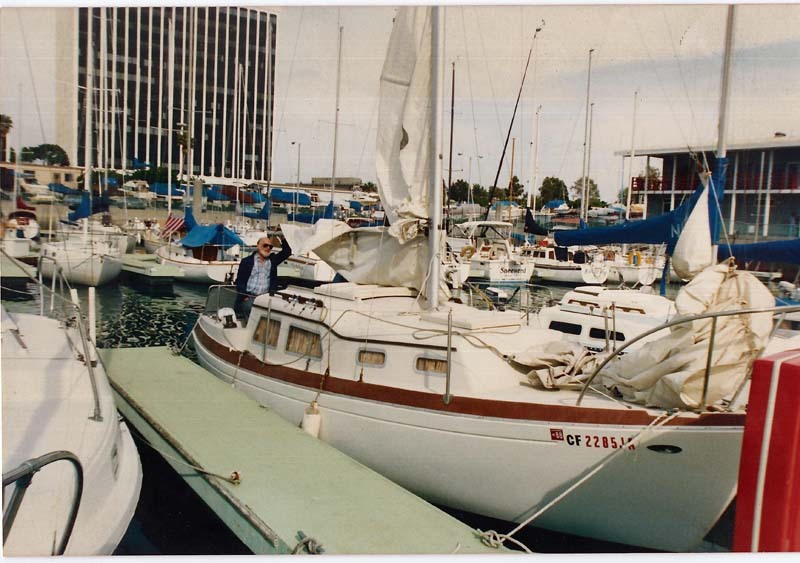 After retiring from The Times, Peeples fulfilled a lifelong dream – he bought a 27-foot sailboat, which he christened Billow and docked at Marina del Rey, a 10-minute drive from his home on L.A.’s West Side. 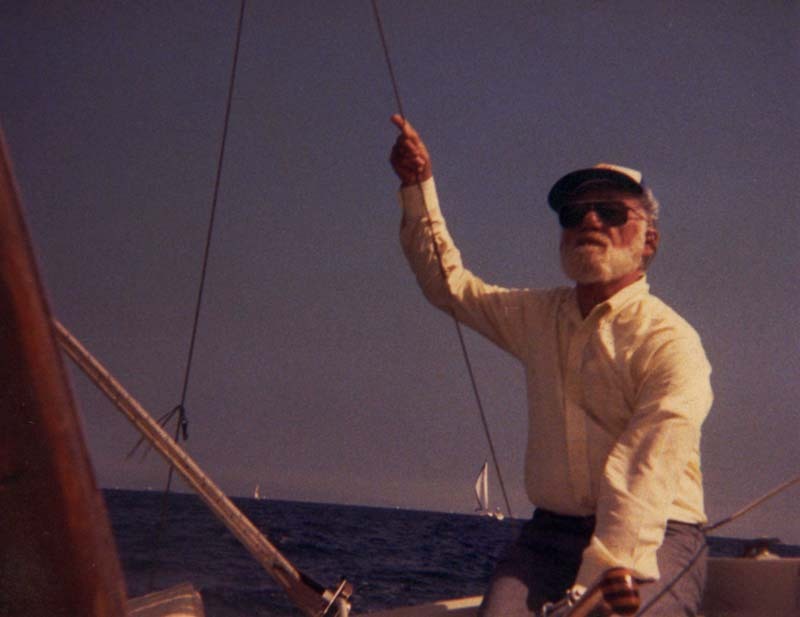 Bill Peeples aboard Billow, 1986. Over the next several years he spent much time captaining the craft. 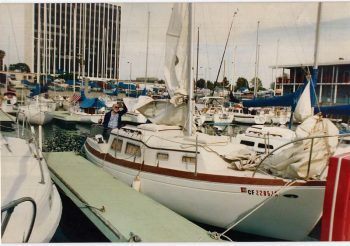 He very much enjoyed taking family and friends for day-sails, enlisting his first mates du jour to hoist the sails as the boat slid out of the Marina into Santa Monica Bay, and rode the wind up and down the coast from Malibu to Manhattan Beach. In June 1990 Peeples suffered a heart attack and underwent triple-bypass surgery. He survived but was forced to sell his boat and adopt a less strenuous lifestyle. During a long recovery, he spent most of his time at home, devoting much time to reading, watching the news and documentaries on TV, and frequently visiting his son, daughter and grandchildren as they grew up. Other favorite pastimes in those years included going to Dodgers games and gathering up his kids and grandkids to celebrate the Peeples family’s Scottish heritage by going to the annual Highland Games. 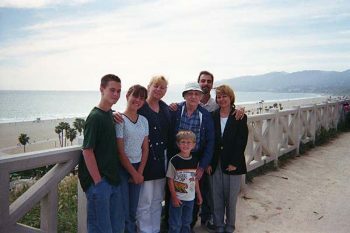 The Peeples Family, Santa Monica Palisades, 2000. Bill Peeples beat the odds and defied his doctors’ prognoses of imminent death several times in the latter ‘90s and early 2000s. He was successfully treated for a walnut-sized skin melanoma on his right forearm, then prostate cancer, and a few touch and go bouts of flu and pneumonia. Still mentally sharp at 79, Peeples nonetheless also was suffering from symptoms of Parkinson’s disease and emphysema, and could no longer care for himself, or be taken care of at home. For his last three and a half years, he was well cared for as a resident of Fireside Convalescent Hospital, close to the ocean at 3rd and Washington in Santa Monica. Stephen and Ruth visited him frequently and took walks to the park on the Santa Monica palisades to enjoy the fresh salt air, the sun, and the spectacular views from Palos Verdes to Malibu. Bill’s last visit to the park was just a few days before he died. 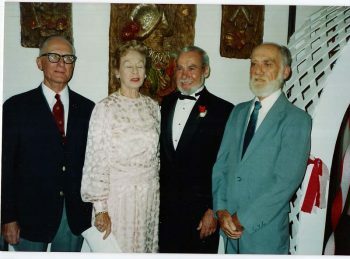 Edward T. Peeples, Persis-Jane Peeples Cline, Richard D. Peeples, William A. Peeples, 1987. William A. Peeples’ early life was shaped by being the middle kid in a big family that made it through the Great Depression better than many others, thanks to a financially savvy father, who died when Bill was an adolescent. 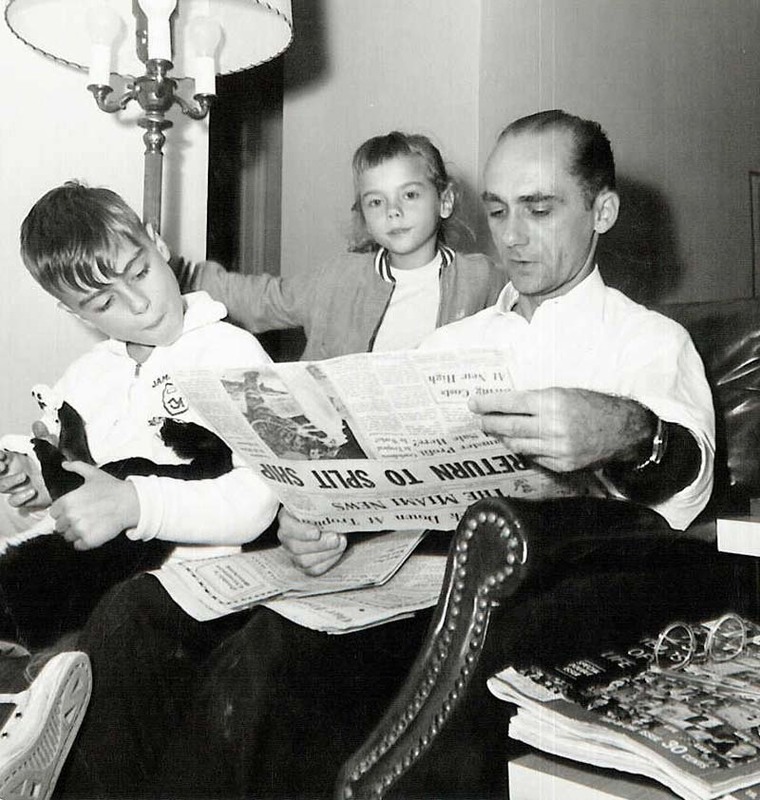 After school, Bill enlisted in the Navy and served all but five weeks of World War II. He was a lifelong news and world politics junkie who earned three top university degrees, the last two post-graduate, while raising a family. His first wife died at age 44; his second marriage ended in divorce after a few short years. Those were just a few of the life-changing events in his life and times. Throughout his years, Bill Peeples was always a source of great knowledge, insight and wisdom to those around him. 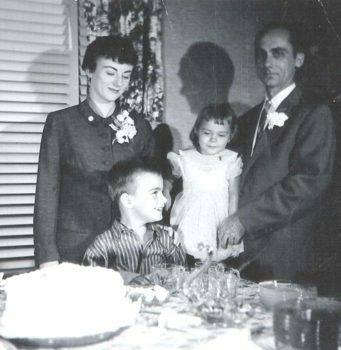 He enjoyed sharing it without pretense, but aware he was appreciated and valued as his family’s patriarch, and by those who recognized his integrity, intelligence, knowledge, civility, warm-heartedness, and devastating sense of humor. Bill Peeples’ family scattered his ashes in Santa Monica Bay on March 6, 2004. 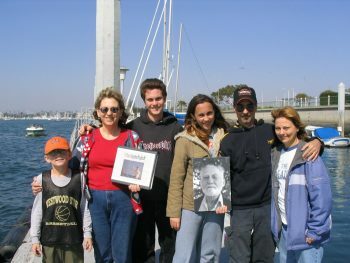 From left: Michael Hooper; Nadine, Scot, Veronica, Stephen and Ruth Peeples. Peeples is survived by brothers Edward Thielens Peeples, 88, of Rio Rancho, N.M. and Richard Dole Peeples, 79, of Wauwatosa, Wisc. ; sister Persis-Jane Peeples Cline, 86, of Scarsdale, N.Y.; son Stephen Kerr Peeples, 52, of Santa Clarita, Calif.; daughter Ruth Locke Peeples, 48, of West Los Angeles; grandsons Scot Lawrence Peeples, 18, of Santa Clarita, Calif. and Michael William Glenn Hooper, 10, of West Los Angeles; and granddaughter Veronica Joan Peeples, 16, of Santa Clarita, Calif.
A memorial gathering to celebrate the life of William A. Peeples II took place Saturday, Dec. 13, 2003 at 11 a.m. in the Chapel and Fireside Rooms of the First United Methodist Church of Santa Monica, corner of 11th and Washington. Family, friends and former co-workers are invited to attend. In lieu of flowers, the family requested donations be made in his name to the Sigma Delta Chi Foundation. 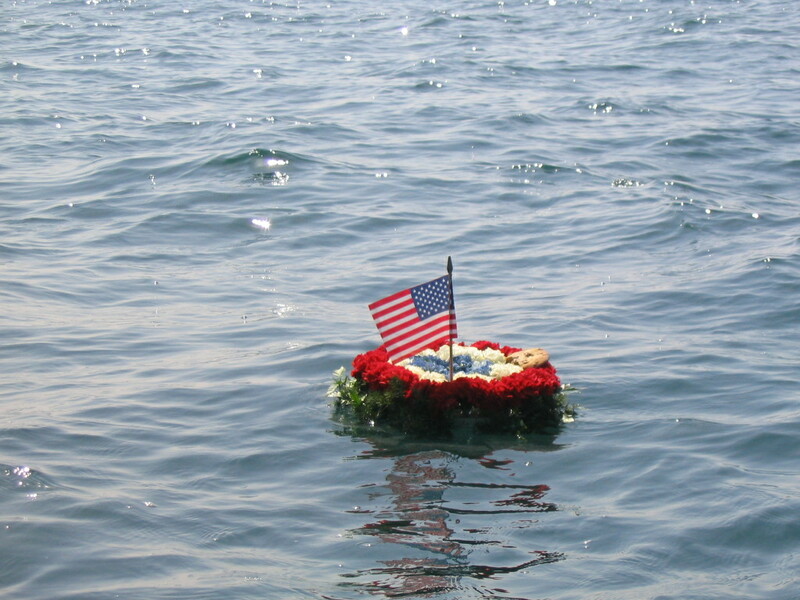 Burial services were private, at sea, in Santa Monica Bay off the coast of Bill’s nautical home, Marina del Rey, where Billow was docked. – Stephen K. Peeples, Son of a Sailor who was also a Scholar, Journalist, Editor, Author, Teacher, Mentor and Traveler. Eternal gratitude to Ruth L. Peeples, Edward T. Peeples, Persis-Jane Cline and Richard D. Peeples for their invaluable insight. Grammy-nominee and Santa Clarita journalist Stephen K. Peeples was an entertainment reporter for Santa Clarita television station SCVTV and its website at SCVNews.com, and for Santa Clarita radio station KHTS AM 1220 and its website at HometownStation.com, from 2011-2015. He hosted and co-produced SCVTV’s WAVE-nominated “House Blend” music and interview program for five seasons, 2010-2015, creating 69 shows spotlighting local artists performing their original material. Peeples was also an award-winning international radio producer and newspaper online editor, and most recently an in-demand website project manager and content editor. He blogs at his personal site, http://www.stephenkpeeples.com.